The NHL will take a break in its schedule from Feb. 9-25 to allow its players to take part in the 2014 Sochi Olympics. It's something the League has done since 1998. But a decade before the NHL decided to let all of its players take part in the Olympic Games, Jim Peplinski traded in his Calgary Flames jersey for the chance to play for his country. The IIHF had given the OK for professionals to take part in the 1988 Winter Olympics in Calgary, but the NHL was still a decade away from signing on. However, there was no ban on individual teams allowing players to play. Peplinski, a rugged eight-year veteran who had scored as many as 30 goals for the Flames, was offered the opportunity to play because of the close connection between team ownership and Hockey Canada. "The Flames owners were very supportive of Hockey Canada and the Olympics, and the organization had committed to build the Saddledome to support the Olympics in 1988," Peplinski told NHL.com. "That appreciation for the Olympics and wanting to assist carried through the ownership, then and now, and so they volunteered a player's services and I got a chance to play." The Flames were willing to let Peplinski go, but they wanted him for as long as possible before he traded in his flaming "C" jersey for a Maple Leaf sweater. That cost him a chance to enjoy some of the trappings of the Olympics. "We played in Philadelphia on a [Friday], Washington on a Sunday afternoon. The opening ceremonies were that Sunday," he said. "I flew out right after the game, got accredited on a Monday, missed the opening ceremonies, missed the first game, played every second day and the Saturday two weeks forward, I got on a plane to Edmonton to play the Oilers and missed the closing ceremonies. "It was a drink with a fire hose -- very, very fast and pretty unique." Peplinski wasn't the only player who had played in the NHL or would do so later in his career -- goaltender Andy Moog and defenseman Randy Gregg had won Stanley Cups with the Edmonton Oilers, and goalie Sean Burke went on to have a long NHL career as a player and now as a coach. But of the 22 players listed on Hockey Canada's roster for the Calgary Games, only Peplinski is listed as being with a club other than the Canadian National Men's Team. While Peplinski understandably was excited by the chance to play in the Olympics and do so in the city he called home, he still feels bad about parachuting onto a team with a group of players who had been playing together. "I would say there were two regrets, in retrospect," he said. "One was that there were a couple of players who ended up not getting to play in the Olympics after being with the [Canadian National] team for quite some time because some pros came in. The other regret was that I never had a chance to practice with the team; by the time I got kind of organized, the Olympics were over." Not that he wouldn't do it all over again. "Having said that, from a selfish perspective, getting to play in the Olympics, for your country, in your home city, seeing what Calgary had done and having the opportunity to observe that from the inside is something that, even with the same set of circumstances, I'd take the opportunity again," he said. The Calgary Games were played on an Olympic-sized ice surface rather than the smaller NHL rink. Peplinski, who had never played at the World Championship, said he took a while to get used to all the extra ice. He expects North American players at the Sochi Games will need some time to get used to it as well. "That big ice surface is going to be interesting in the Olympics this year for those of us who have North American roots," he said. "It makes a huge difference. When you have another 10 feet to chase somebody, it's kind of like playing hide and seek and the other guy has an extra building to be discovered in that you don't know about. That extra 10 feet around the ice surface is absolutely huge. It takes an adjustment, to be sure." The Olympics were played with a different format then than the one that's used now: The top three teams in each of two groups went into a third group, kept the points they'd earned against teams in their own group and played the teams they hadn't faced in the earlier round. The three nations that ended up with the most points earned medals. Canada made it into the final round but ended up finishing fourth with a 2-2-1 record. One of those losses came against the Soviet Union. The 5-0 defeat left an indelible impression on Peplinski. "I remember Sergei Makarov going around Tim Watters, who I played against in Winnipeg; he was a clutch-and-grab kind of defenseman, a great competitor who I found very difficult to play against. Makarov went around him and Tim got on his back and I thought, 'He'll slow him down.' But Sergei went right to the net, with Watters being dragged along," Peplinski said. "These guys were incredible athletes, incredibly well-conditioned, tough mentally. "These guys were men playing with boys when it came to the Soviet Union against Canada in that game. We left dejected because we played pretty well and we were still short five goals." 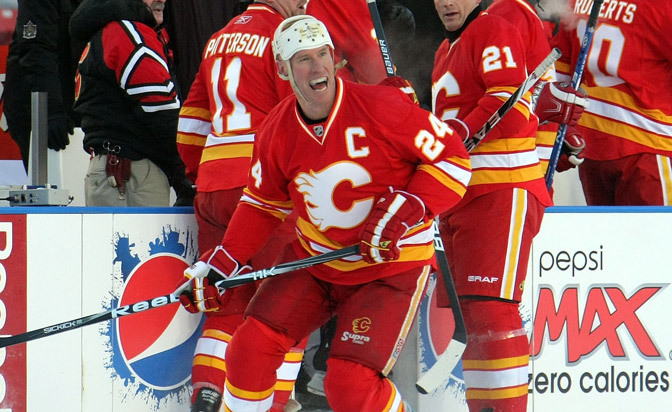 After contributing one assist in seven games, Peplinski went back to the Flames, helped Calgary win the Stanley Cup in 1989, then retired early in the 1989-90 season, though he made a brief return in 1994-95. He's gone on to become a successful businessman and has been active in the Flames' alumni association. Peplinski said he's supportive of having the NHL allow players to compete at the Olympics because doing so brings all of the world's best talent together in the same tournament. "I think it's great," he said. "The only concern I have is that the professional athlete really takes over from the true spirit of the Olympics -- 'Stronger, Higher, Faster' is a noble objective -- and when you start to have professionals play, I had a little bit of pause on that. But the reality is that the people who've been competing in the Olympics, skiers and many others, they may not be getting paid because people may not be willing to pay to watch their sports, but they're professionals in every other measure of their disciplines. "With the exception of the National Hockey League taking the spotlight from the Winter Olympics, which is kind of understandable -- it's just the way it is -- I think it's great that you've got the world's best at the competition. I think if you want to be awarding championship medals to any discipline, you've got to open it up to the world's best, and in order to do that, the National Hockey League has to compete when it comes to ice hockey."